Neuralgias can be some of the most painful and suicidal experiences we ever go through. Luckily we are beginning to understand a lot more about what causes them and how inflammation plays a massive role in all sorts of head pain. In this article, I will be covering 3 secrets of tic douloureux headaches and trigeminal neuralgia which will give you a far more in-depth understanding of what is going on than just seeking a diagnosis may. Definition / What are tic douloureux headaches and trigeminal neuralgia? These conditions are one and the same, just different names. Tic douloureux means a painful tic because of the sudden and severe pain that may cause you to wince. 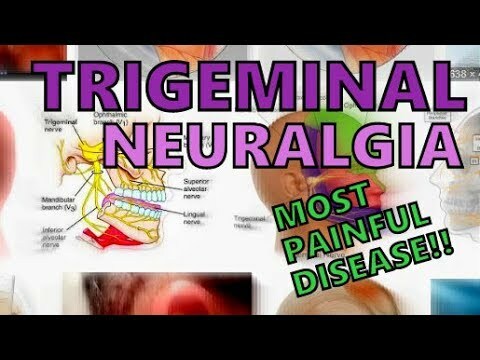 Trigeminal neuralgia is a form of neuralgia(pain along a nerve) which specifically affects the trigeminal nerve. It often presents as extremely severe and one-sided, usually coming suddenly in spurts and lasting only minutes but sometimes hours. As we age, these pain-free periods tend to get shorter and the painful periods tend to get worse. This would lend itself to suggesting that the body is having a harder and harder time coping with whatever physiological stress is causing the problem and taking resources away from healing it such as all of the nutrients needed to rebuild myelin sheath. Trigeminal neuralgia or tic douloureux headaches are more common after 50 years of age as the body becomes less adept at recovering from injury, absorbing nutrients and maintaining normal function in the nerves. See the video below to get a better understanding of what tic douloureuxe headaches and trigeminal neuralgia are. There are many different perspectives we can take on what is causing trigeminal neuralgia but there is likely no one single cause and this means we need a multi-factorial approach. We need to approach it from a number of different areas including nutritional, inflammatory and systemic which means we need to look at the whole body and understand what’s going on. The trigeminal nerve is the fifth cranial nerve and directly enters the brainstem through the pons. This means it connects right into some of the oldest and most basic functions of the brain. The brain stem controls all of our basic survival functions and is called the reptilian brain because of it. The trigeminal nerve is composed of three main areas, the ophthalmic, maxillary and mandibular or more simply the eye/forehead section, the cheek section and the jaw section. But this part of the brain, because of its constant need to pump out energy to run all of our base functions is also susceptible to overload. The trigeminal nerve is essentially a slave to other more important systems of the body because the body puts systems into priorities. Just like muscles, arms and legs are a much lower priority than our organs. If we are under a huge load and our body is constantly strained in simply running the most basic of functions then our brainstem can actually end up having to vent and will use nerves as a sort of “breaker” to let off steam. But it also happens with the brainstem because of its key role in all of the body systems regulation. This can become too much and the closest and easiest way to vent is to go through the cranial nerves. This means we want to bring down our brains and nervous systems total load which ill talk about towards the end. I covered it briefly above but the body and brain are always communicating and when an area of the body, for example, the liver or intestines or uterus are having trouble, going through inflammation and increasing its level of activity to speed up healing, it will also increase its output to the brain. Because of the brainstems role in regulating autonomic functioning, there is a massive demand on it to provide enough support and keep everything running at full capacity. Stress compounds and so if for example liver function goes down, then toxic load will go up which will cause energy production to go down making adrenaline go up and as adrenaline goes up intestinal circulation will go down causing endotoxin production to go up eventually circling back and causing liver function to go down even more. It is a vicious circle and we want to lower the load that is put onto our nervous system but this has to be done holistically, mind and body. Our mental and emotional stresses and the way we react to things take priority because they control everything all the way down the chain. If you need help with what you are experiencing right now and want more specific information then join the Migraine Professional community here. Have you ever experienced tic douloureux headaches or trigeminal neuralgia? If so, let me know below what worked for you and what your experience was like.